The VersaLink C600 Color Printer represents the new definition of exceptional performance and unbeatable reliability. Cloud-connected, mobile-ready, app-enabled, and easy to customize, the C600 is your modern workplace assistants-transforming the way you work today, while ensuring you'll stay one step ahead tomorrow. RELIABLE PRODUCTIVIT Y AND PEACE OF MIND. Right out of the box, you'll count on your VersaLink C600 consistently and flawlessly perform the tasks that make your business work more efficiently. From IT-free installation wizards, to step-by-step configuration options, you're ready to go - hassle free. Completely re-engineered for superior reliability, the VersaLink C600 feature a new hardware design with fewer moving parts, and a more advanced Hi-Q LED print head. MOBILE FREEDOM AND APP-BASED FLEXIBILITY. 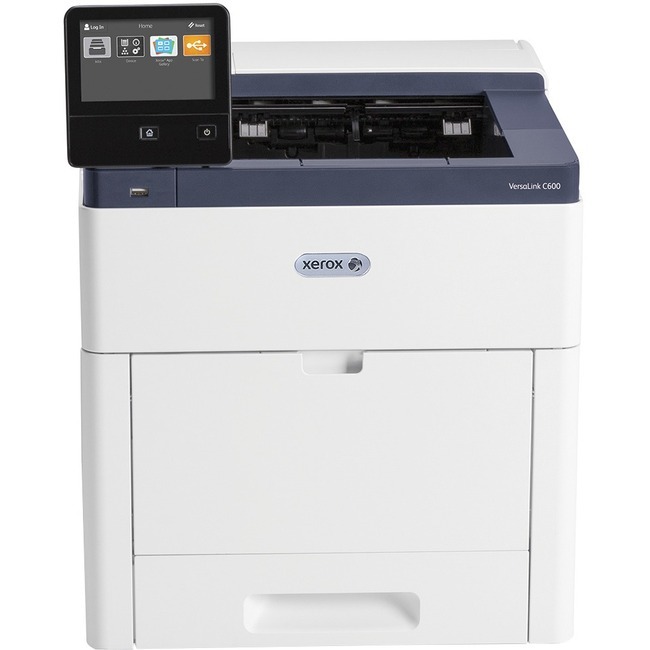 The VersaLink C600 Colour Printer and VersaLink C605 Colour Multifunction Printer give you the freedom to work where and how you want - with out-of-the-box connectivity to Google Drive™, Microsoft® OneDrive® and Dropbox™, and access to additional options through the Xerox App Gallery. The ability to connect and print from multiple devices is key for today's worker, and VersaLink devices meet the challenge with Apple® AirPrint®, Google Cloud Print™, Xerox® Print Service Plug-in for Android™, Near Field Communication (NFC) Tap-to- Pair and Mopria®, plus optional Wi-Fi and Wi-Fi Direct.